Finding the best beach wedding music for your St. Petersburg Beach wedding or a great live band for your next corporate event can be difficult at best. 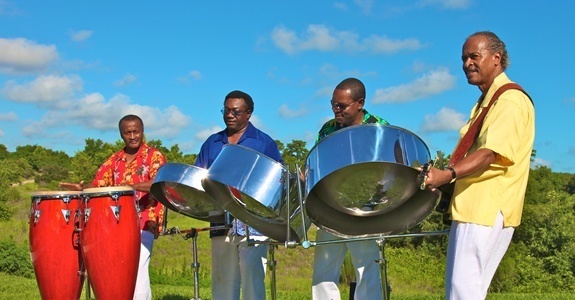 Think outside of the box and enjoy the best calypso, reggae, soca and steel drum music from RythmTrail steel drum band. We’re just a click or phone call away and can provide your next event with the upbeat and lively sounds of a complete steel drum band or a simple but unique solo performance, so you can be sure you’re going to get the perfect music to suit your party’s theme—and its budget. Native Caribbean islanders with over 20 years steel drum playing experience will ensure you’ll get top Steel Drum Players in the state to make your special day a truly memorable one. RythmTrail plays beach weddings and other events or gatherings in St. Petersburg, as well as throughout the state of Florida, nationwide and internationally, so you can be sure you’re going to get the best romantic ceremony music and rocking live band, all rolled into one—wherever you need us most. We’ll even let you create your own special playlist of songs and music, or let RythmTrail take care of the music and set the mood with dancing, upbeat or even romantic music that will suit all ages and please all audiences. Call RythmTrail today at 866-495-4522 or get a free quote online and sweep your party away to the Caribbean Islands. Steel Drum Band event updates in St Petersburg FL and nearby cities. Saturday Oct 15 2016 RythmTrail Steel Drum Band will be playing at Sunset Pavilion, sunset beach in Treasure Island Florida. Hire the best steel drum players in St Petersburg Florida. Our Steel Drum Band event update for Mar 5 2016. We are playing at Pass a Grille Way, St Pete Beach FL for a 50th birthday party celebration. Hire our steel drum players for beach weddings, anniversary, corporate functions, rehearsal dinners and more in St Petersburg Florida. Where are we playing today Feb 21 2016? RythmTrail Steel Drum Band will be playing in St Pete Beach FL today at Don CeSar Hotel for a Corporate Function. Also appearing tonight is RythmTrail’s Junaknoo Band and Moko Jumbies / Stilt Dancers. The best steel drum music and Caribbean entertainment in St Petersburg FL and surrounding cities.